Forgiveness and judging are at two ends of the spectrum…can you see that? One joins us together and offers support, the other separates us and adds to our loneliness. When we are judging (Complaining, Criticizing or Condemning: the Big 3 C’s) ourselves and others (which we can do EVERY DAY) it results in separation and isolation from our true selves, others…and God. It separates us from loving ourselves in that moment. We can feel anger, resentment, frustration, and more suffering. Do you ever say to yourself, a child or someone else something like: “You dummy; or stupid, jerk” or worse? If it’s about ourselves then we will feel that we are a victim; and we cannot heal when we stay in a judgment / victim mode. Do you want to feel that way, even if you think you have a “right” to? Do you want to feel alone and isolated? You may feel justified…but that doesn’t feel good…it does not feel loving and healing! This is damaging physically, psychologically and spiritually to our self and the other person. If our only goal is inner peace, then we really do want to choose differently. The first step is to be aware that we are judging/criticizing then acknowledge our judging. Start by paying attention each day to when you criticize yourself or another person. Forgiveness is a gift we give ourselves! Can you understand that painful actions are coming from unhealed emotional wounds, usually from childhood, or some younger life, that are being acted out, expressed still today? If these issues are resolved in adulthood then we are not as likely to “act out”…not as likely to come from fear so often or to such an extreme, and it is quicker and easier to come from love. There are stories in Attitudinal Healing where parents and loved ones have forgiven murderers of their loved ones! They released their hatred and felt compassion and love. They hugged and cried together. Now, that is forgiveness. And it is a process. It took them awhile to get there. Forgiveness means that we want to live with an open heart and hold ourselves and others in our hearts and not hold on to our unhealthy feelings and fear-based thoughts, which harm us. Forgiveness is grace and is not something you “do” but something that reveals itself. Grace is an attitude and it does not imply that a specific action must be taken by either person. With grace as our intention, we experience an inner change in our perception of how we see another person (and/or ourselves). Furthermore, forgiveness reduces stress and positively affects the physical and mental health of the person doing the forgiving. Good reasons to forgive! Try it! I have had two people who I have had an especially hard time forgiving in my life. One was my ex-husband and the other was a teacher what was particularly critical of one of my children. I has angry, disappointed, and sad at times. I thought they “should have known better” after all, they were adults. I was judging and criticizing. Finally I realized that when I did that I felt lousy inside and decided I did not want to feel that way any longer. I could change my attitude! Forgiveness is for me! I could let them “go” and know that they will feel the consequences of their actions in some way. It is OK for them to be them in whatever way they want to be…and I want to be me; kind, giving and forgiving, I hope. PANDA-POWER of the NOW Moment! Since the 1922 American silent film and the first 3D feature film worldwide, The Power of Love movie is an example of our societies’ fascination with the artistic value of seeing and hearing about Love. Up to now there are hundreds of versions of Love stories on the screen and in videos and in songs such as those by Elton John, Chicago, Foreigner, and who can forget, The Power of Love by Celine Dion! And there are many more. When we are in a truly loving relationship we have our moments of NOW when nothing else is on our minds but that moment, like time stands still…but those are fleeting. Can we create more of the NOW / PRESENT MOMENTS? I think this is one part of the most challenging aspects of our spiritual practice. To be able to get our minds into a quiet, present moment of inner peace and then to continue that attitude moment by moment, day by day, to the best we can. As we follow-up from the previous Blogs and most recent, “NOW! Into my Power!” I hope to reinforce the idea of what Echhart Tolle says in his book, The Power of Now, which he draws from a variety of “spiritual traditions” which I do, also. He supports our belief that “individuals should be aware of their ‘present moment’ instead of losing themselves in worry and anxiety about the past or future.” The author maintains that people’s insistence that they have control of their life is an illusion “that only brings pain”. Because it is our Human Ego and not our Spirit that needs to control and brings negative effects on happiness. Our Spirit / Love only brings us inner peace and tranquility. This happens when we stop our minds from thinking of the past/future and are truly in the NOW moment. Meditating to get in touch with your inner self to become the empowered person you were meant to be. It’s the only way to center and balance our spirit. When you start and end your day with positive energy and spiritual reflection, you’ll find that your life will truly change for the better. Little Rock the kitty, above, likes to do Yoga daily to release stress! Let go of stress! Let go of the pain of the thoughts of the past and future. When are you ready to make that decision? When will you really “know yourself? BE yourself? Learn from the past but you can only BE you in the NOW! Just when you want to chill out, doing any of these daily practices can help bring balance, love and laughter to your daily life. Just do something…to de-stress and for peace of mind! Author Susan at AwesomeAttitudes2D-StressPosted on June 5, 2018 June 9, 2018 Leave a comment on PANDA-POWER of the NOW Moment! each instant is for GIVING. Personal Note: I am reminded that Attitudinal Healing is a “Process” and I realize that I am learning something new as I re-learn and remember that…LOVE is the answer…and my only goal is inner peace. I hope this is still worthwhile for you, also. To live life fully is to live every moment to its fullest. That statement immediately makes me wonder how often I am paying attention to each moment? How often am I “mindful”? When I am in the present moment then I am in connection with my “power” and intuition, and when I am in the past or future (as we learned in Principle #4 last month) I am not…I am then in a ”weakened” state of mind. I try to keep remembering to “live one moment at a time”, as well as each day at a time, as I know I have enough to deal with TODAY, let alone letting the past or future interfere in any moment. And I know I am happiest when I am in this moment; NOW…when I can experience God / Higher Power. We can only hear / feel our inner guidance (of love) in the present moment, the NOW moment…and it continues to guide us in each moment as we “stop and listen”. And each moment is for giving…giving what? Giving LOVE! Oh, yah! As our “only goal is inner peace”, we experience that peace when we are giving love in the moment. As we learn in Principle #12, we have the choice in that moment, to either extend LOVE or give a call for help from a place of fear. This principle #5 focuses on the giving Love part, which is our natural state of being (Principle #1). I am sure you have been in situations where you immediately felt stressed (especially I find this happens in relationships!!!) and you begin to respond with frustration and /or anger? I try to remember to ask myself the question, “Would I rather be right or happy and peaceful?” And I also try to remember I have a choice…so, if I can take a minute (like go into a bathroom for a “break” from the situation) and go to my inner guidance and realize that I can “choose love/peace instead of this/stress”, and go back into the situation extending love, not needing to be right, or the “victim” then the situation changes in some way. I don’t always get “my way” but I do get the “way of love”…and that is truly my only goal – to be peaceful! LOVE IS THE GREATEST HEALING FORCE IN THE WORLD. Period. Trust that this is true. Try it! And remember that healing is letting go of fear. It does not always mean that we have physical healing, but healing of the mind, which brings inner peace. And finally remember… that giving LOVE in the moment is an unconditional act without expectation of return… that “my loving” is good for me…and for others…and the world! Author Susan at AwesomeAttitudes2D-StressPosted on May 13, 2018 Leave a comment on NOW, into my Power! TIP below *: To see Qi Gong exercise for energy, Centering and inner peace. WHERE IS YOUR MIND LIVING? This is perhaps one of the principles that many people relate to the most and have such a hard time practicing. We are asked, here, to be fully open to the present moment…to pay attention, be mindful, of NOW, today, this moment. In order to find inner peace we must get rid of our thoughts of our past and how we perceived a situation to be, especially those that are not peace-filled memories. We cannot change the past, no matter how hard we think about it and want it different. When focusing on the past those thoughts can become patterns of belief and then patterns of behavior in the present. Do you continue to think about your past…over and over again? Are you still “living there”? If so, the past is recreated again and again in our present experience because we continue to act / react as if the past was still here. In this way we are living in the past while we are acting in the present…and we are choosing to feel the stress from the past that is robbing ourselves of our present joy! WOUNDED WARRIOR / SUFFERING: As we live in our past in unpleasant memories, we continue to believe that we are a victim of that past (which, by the way, I say again…we cannot change the past…but we (unconsciously) keep trying to think of ways to try to do so). As a wounded person we can be stuck in the past and cannot move forward to heal. We need to heal the trauma of the wounded “child” that was hurt in the past. This does not mean that we say what was done was right or not harmful…but we do not have to let it hurt us any longer. We are asked to be willing to give up the old feelings that we had in those past situations…feelings that we might believe we have a “right” to feel. After all, “That person did that to me,” you might think. Or, “I was wrong. I am guilty.” With this principle we are asked to let go of the past feelings, once and for all…and choose peace instead. This can take time and time again to release but eventually we can chose peace more and more often! “I can choose peace instead of this” A Course In Miracles tells us. A great question to ask is, “Would I rather be right (ego based) or be peaceful?” Which is more important to you? The world will tell us to be “right” but our spirit tells us to choose Peace. Being right can actually mean conflict inside us as we feel the stress the past is still bringing in the present moment. Which do you want to feel? What do you worry about that could happen, or not happen, in your future? I know a big “hook” for me has been about money. I can get a bit in my stomach that tells me I am in my fear base. I don’t like that! How about you? What do you worry about? Not having enough money in the future, poor health, family issues, the earth, world peace, politics, gun violence, etc.? Do you know what FEAR stands for? It’s False Evidence Appearing Real. That means that we can be worried now about something that might NOT even happen…and again this worrying robs us of our present joy! This does not mean we don’t do some planning for our future. It is about how we FEEL about it. It takes trust in our spiritual beliefs to let go of the worry / fear of the future and be in the present…that all will work out for our highest good. There is a saying, “Let God handle the details”…and stop worrying. Some might call this Faith / Trust. WAIT…just a moment…when you find your mind is thinking about unpleasant past situations or worrying about the future…STOP! BE HERE NOW (as the book by Ram Dass says from 1971). Why do we want to be in the PRESENT MOMENT? Because this is when we can truly only release stress and feel love and connect with our Higher Power / God, and make a choice to choose love, peace and happiness over conflict, stress and fear. Staying in the present moment involves being honest with ourselves about what we want to experience…and we can ask ourselves, “Would I rather be right (justified that the past was painful and continue to dwell on it…or worry about what might NOT even happen in the future) or would I rather be peaceful and enjoy NOW? You wait; you choose. 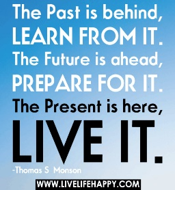 What are you benefiting from holding on to the past or worrying about the future? An important aspect to remember is that we have the power to choose…to choose peace instead of the past thoughts or worrying and stress that those bring. As we continue to choose peaceful thoughts over and over and keep letting go of the fear-based feelings they will disappear and we will choose to live more in the present moment. Attitudinal Healing teaches us to stay in the present moment to experience the richness of life, and love that is inside us NOW and always. (Some concepts are taken from “To See Differently” by Susan Trout (out of print but has been available through Amazon.com). Each time you come to this blog you make a choice to Leave a Reply (below) and/or Click the Like button, both of which I truly appreciate if you would choose! Author Susan at AwesomeAttitudes2D-StressPosted on April 22, 2018 May 13, 2018 2 Comments on What? Me Worry? …Wait! A number of years ago when I was seeing a therapist as an unhappy, passive, housewife, she indicated to me that there was no such thing as real altruism…I was confused…surely when I give to people, my family, friends, I am not receiving anything back from them. Or am I? I now know that I DO receive…I receive good feelings, that I did a good deed. I receive their thanks, and it is important to them as well as to myself to receive fully and graciously so they feel good about receiving from me. Do you see how giving and receiving is a flow of energy between people (maybe even elephants)? There is a connection and unity now between two people that did not exist before and needs to be nurtured. Even if others do not outwardly give us their thanks, we still receive the positive feeling that we did give to them. When we give, if we do not acknowledge that we receive from the other person, we unconsciously think of ourselves as the “strong one, or the smart one, or the one who doesn’t need help” and them as “weak and in need of my help.” This position not only separates us, it also feeds into our own fears of our own weaknesses. And it can give the message to the other person that they are powerless and dependent. Giving is essential to our own well-being and healing. Dr. Jerry Jampolsky, founder of Attitudinal Healing 35 years ago, has many stories of relief or healing when we give to others. This is an opportunity to experience being charitable and allowing someone else to accept our loving “gift” whatever it may be…a phone call, a smile, a present, food, work, helping, listening, serving others, etc. To give without the awareness that we receive can lead to emotional fatigue and burn-out. It is important that each of us feel nurtured and even energized in a relationship. Give with LOVE! Open to receive Love! YOU deserve it! As well, how about giving money; does the same apply here? Yes…and ten-fold. It is an old principle that when we give to others, and increase the flow of money, we are rewarded much more. And again, we are talking about the flow…giving and receiving. Think of it differently this way, also; when you give money it is then received by another who then gives it to another for something, etc. And the flow goes on, and even unconsciously we are thankful for what we receive for the money we gave…even if it’s our electric bill! If we give with the expectation that our needs will be met then, we are giving for the “wrong” reason; we are to give unconditionally then open to receive for true connection. And what is the most important thing to give and be open to receive? Of course it is LOVE…all our lives! Giving and receiving is a flow of energy between people and connects people together…connects hearts. In the Leave a Reply area below, please tell me about some time that you remember you gave something what you consider awesome for you. OR write a short reply about an awesome time you received. Let’s see what kind of things people say!!! Just do it! “I received a birthday surprise at my door: flower, birthday card, a song, a stuffed monkey and balloons from a gorilla! Author Susan at AwesomeAttitudes2D-StressPosted on March 22, 2018 April 23, 2018 Leave a comment on What to Give??? What ARE…Why USE…the 12 Principles of Attitudinal Healing? As you learned in my first Blog post in my Mission and Purpose, I was a part of a Center for Attitudinal Healing (AH) for over 20 years and I use the AH thoughts and 12 Principles every day. These idea are UNIVERSAL as the TRUTH is the TRUTH and many philosophies do believe the same things, just may say them a bit differently. Attitudinal Healing is a cross-cultural method of healing that helps remove self-imposed blocks such as judgment, blame, shame and self-condemnation that are in the way of experiencing lasting love, peace, and happiness. It is based on the belief that it is not people or experiences outside of ourselves that cause us to be upset. Rather, it is our thoughts, attitudes, and judgments about them (outside influences) that cause us distress. The approach and philosophy is based on universal principles and forgiveness. People of all ages, beliefs, walks of life, and cultures benefit from the practice of Attitudinal Healing. Attitudinal Healing encourages us to reexamine our relationships, bringing them into the present by releasing past judgments and grievances. Attitudinal Healing is based on the belief that all communication is for joining and not separation. THE 12 PRINCIPLES OF AH BENEFIT PEOPLE BECAUSE THEY HELP TO EXPAND OUR PERSPECTIVES BEYOND NORMAL CONSCIOUSNESS AND THINKING INTO A MORE POSITIVE WAY ON HOW TO RESPOND TO OTHERS AND LIFE SITUATIONS. WE LEARN THAT WE CAN MAKE THE CHOICE TO ENJOY A MORE PEACEFUL, WORRY-FREE AND LOVING LIFE. Author Susan at AwesomeAttitudes2D-StressPosted on March 15, 2018 April 23, 2018 Leave a comment on What ARE…Why USE…the 12 Principles of Attitudinal Healing? So then, how do we let go of these fear-based thoughts? I pace myself with one step at a time. I know the perfect circumstances present themselves for my perfect continued growth. I am LOVE. I am JOY. I am PEACE. As for healing of our bodies, this may or may not occur. Again, we are focused on healing of the mind here. I know this can be a different thought for many. Some “higher” thoughts about dis-ease might be: “Dis-ease has no value but to get our minds to turn to God. 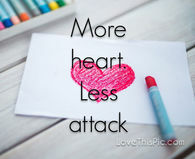 There is no other gain in dis-ease…so why stay there?” Our daily intention to continue to choose healthy habits in mind and body help us to let go of stress…but there are no guarantees…but many of us know that we can choose Love and Inner Peace and greatly reduce stress in the presence of illness. I had a bout with cancer and just knew I would be OK with the support of prayer and wonderful people in my life. I tell a little about this in the About Me section of this blog. We can unlearn and get rid of our blocks to love and peace as we continue on our journey of Attitudinal Healing, continuing to have reminders and connecting to other like-minded people who support us to be who we really are….LOVING beings on this earth! It is a process of choosing LOVE in any situation. My goal: 500 subscribers! Then I will have a FREE GIFT for all! Please share my blog with others.